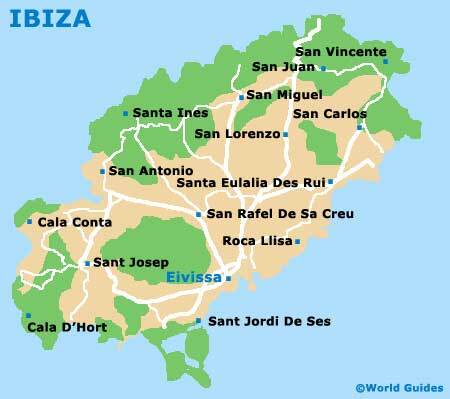 Many people come to Ibiza for a beach holiday or party vacation, sunbathing by day and clubbing by night. Local tourist agents provide a choice of interesting excursions to attractions all around the island of Ibiza, including day-long sightseeing trips, cruises and safaris, as well as visits to casinos and theatres. Those who fancy moving on from Ibiza may like to plan an island-hopping holiday, exploring the attractions of the Balearics. Regular ferries make crossings to Mallorca and then Menorca, although the trip is a lengthy one. If time is of the essence, then you may like to consider flying between island airports, with direct flights being considerably quicker than ferry crossings, although more expensive. 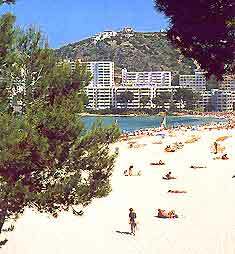 Mallorca is the largest of the Balearic islands and has a population of around 680,000, half of which is concentrated within its capital city of Palma. There are almost 80 glorious beaches on Mallorca, providing excellent opportunities for both swimming and sunbathing, and these are always extremely popular during the summer months. The landscape is really rather diverse and features everything from central fertile lowlands to dramatic mountain peaks, such as those of Serre de Tramuntana. Much of Mallorca remains quite natural in its appearance and if you venture away from the resorts and beaches, you will soon discover charming inland villages, large pine forests and secluded coves. The island of Mallorca has a real host of attractions, including some awesome underground caves, native wildlife and more than a handful of mature olive groves. 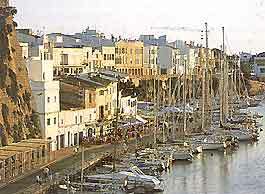 Menorca is the second-largest of the Balearic Islands and is smaller and noticeably quieter than neighbouring Mallorca. Situated just 34 km / 21 miles from Mallorca, the island of Menorca is perfect for families and boasts almost as many beaches as both Mallorca and Ibiza combined. Menorca has somehow managed to escape the world of package holidays and the island's small towns and villages offer a fairly quiet and relaxed holiday, even during the busy summer holiday period. Menorca is an especially verdant island, with woodlands of pine trees and many fields for the island's 25,000+ grazing cattle. Bicycle trails criss-cross the meadows and scrublands, where they boast some exceptional panoramas of the island and its coastline. The north coast of Menorca is rocky and rough, while the contrasting south coast contains lots of quiet sandy coves, sheltered by cliffs. The oldest and largest towns on Menorca are Mao - the walled capital, which is situated at the end of an enormous natural harbour, and Ciutadella - the ancient capital at the opposite end of the island. Mao is a particularly busy port town and has many impressive architectural features. Ciutadella is a more graceful town, full of winding streets and old buildings, including several churches.